We do not limit the numbers attending any classroom fire extinguisher session. Therefore this can represent great value for money for your staff fire training. However, we do limit the number ofpersons attending the practical session to twenty persons. Tis is so we can maitain a safe environment for your staff. In addition, we also base our fee on approxiamately ten persons taking part in the practical session. If you want more persons to take part in the live fire training session either email us or call us for some training suggestions. We use an environmentally friendly fire training rig that is fuelled by LPG. We also use water, faom and CO2 fire extinguishers and can also deminstrate Wet Chemical for those with a commercial kitchen. If we visit your site and carry out a live fire training session, your outside space must meet our safe area criteria. For more infomation either look at the paragraph above or give our team a call. How many persons can attend a fire extinguisher session? What type of fire training rig and extinguishers do you use for live fire training? CALL 0207 419 5001 TO BOOK YOUR SPACES NOW! Fire awareness, fire law and common causes of fire. Jet, spray and mist extinguishers. Safe use of fire extinguishers. Fire extinguisher DVD or live fire extinguisher demo. Attendees on this fire extinguisher courses London programme get a training certificate and also online training notes. We can also provide a group certificate for your training records. Do your staff need fire extinguisher training? Approved fire extinguisher courses London are ideal for regular staff fire training. Our course is accredited, so your staff can be sure of up to date and relevant training. The courses are based on government guidance, British standards and also published fire service advice. The open fire extinguisher courses London sessions include fire extinguisher practical exercises. On-site courses can also include a fire extinguisher training as an optional extra. Our team use a safe LPG training rig and also water, foam, CO2 and wet chemical fire extinguishers. We limit the number of persons taking part in a practical session to between twenty and twenty five persons depending on the size of the outside space. This is so we can ensure a safe practical exercise for all persons taking part. In house fire extinguisher training London programmes is given in different ways. We can provide training with the above content or also as shorter sessions. As an approved fire training centre you can be sure of great training. Your in house fire extinguisher training London session can also include live fire extinguisher training. Any outside space must either be owned or controlled by your building. If you do not have an area like this, you may also use an area that you have permission to use. Look at our frequently asked questions for our outside space requirements. Our fire training teams can provide fire extinguisher courses London in 2 hour and also half day formats. We do limit the number of persons taking part in live fire training, so we can be sure of attendees safety. The limit is 20 persons per session. About seven metres in width and also 3 metres in depth. Not near combustible or flammable sources and air intakes etc. Hard standing underfoot and not visible by road users. On your land with no public access. Agree our on-site risk assessment. How many can carry out live fire training sessions? We limit the number of persons on a live fire training session to about 20 persons so we can assure all persons are safe. However, you can get more people to have live fire training sessions by doubling up on the number of live fire training sessions. Either call us or email us for more details of fire extinguisher courses London. In the event of extreme weather conditions, we may need to either limit the types of fires students tackle or operate extinguishers without live fire. This is a very rare event so usually do undertake all practical sessions. If you need more information about our live fire training either call or email us. Once booked we will provide our insurance details and also can also send our pro forma risk assessment for your records. Our fire extinguisher courses London programme has been based on government and fire service advice. We offer a money back guarantee that your training will marked as suitable and sufficient by any visiting fire safety officers. As an approved fire training centre, we can also adapt our training sessions and tailor them to your workplace. This means we will look at your building and highlight the most likely type of fire. We will then talk about the best extinguishers that you will use on your tailored fire extinguisher courses London programme. If you need tailored fire extinguisher courses London programmes, this is what you need to do! Call us and tell us about your building. We will also need to know what type of extinguishers you have in your building. In addition, we can include your fire emergency plan to your fire extinguishers courses London programme. How many people can attend an in house fire extinguisher training London course? You may place as many persons as you wish on an in house fire extinguisher training London course. However, we do try to limit the numbers taking part in an outside session to about twenty persons. This is so we can keep everyone safe and keep an eye on everyone! However, if you need more than twenty persons to have hands on fire training we can do two sessions. All persons up to twenty persons will get a personal fire training certificate. We also provide a group training certificate on request or for groups with more than twenty attendees. If you have a group certificate we can add the list of names on the back of the training certificate. We want a practical fire extinguisher session at our premises. What do you need? Our team need a safe outside space. The area outside should be controlled by yourselves or where you have permission for the exercises. The ground should have hard standing. It must be not visible from a main road or accessible by members of the public. We cannot do it in a street beside your building!!! The area must be away from combustible and also flammable sources. It should be away from air intakes and air conditioning units. Lastly, the area should be about 5 car parking spaces in size. Still not sure? Either call or email us for more details of fire extinguisher courses London. Some managers send pictures of the space and we can also look on Google Earth if you give us an exact location. We only want to train a couple of persons on fire extinguishers. What are our options? We hold open courses so those just need one or two staff can attend. Courses are held every month in South London. We recommend that you book early to get your places. Alternatively, staff can opt for our online fire extinguisher training course. It is also IFSM approved and take under an hour to complete the programme. What type of fire extinguishers do we use on a fire extinguisher training London session? Water extinguishers, foam extinguishers, CO2 extinguishers and wet chemical fire extinguishers are used on the fire extinguisher course. Up to ten of your staff can have hands on training with our fire extinguishers. Remember, we use an environmentally friendly fire rig that burns lpg through water. Therefore, we need a safe outside space away from a main road and any place where there is public access. The space needs to be about five car parking spaces in size. It must also be away from combustible materials, flammable sources, air intakes and windows. Lastly, the outside space needs to be on hard standing and also a space owned or controlled by your organisation. Who needs to be trained in the use of fire extinguishers? This is a common question to our office and also trainers. The answer is quite simple. Everyone must have fire extinguisher training. Government fire safety guidance details what is in a fire emergency plan. The plans must include fire fighting equipment in the workplace. As all workplaces must have fire extinguishers, then all staff must be trained. A further question on our fire extinguisher courses London is “How often should staff be trained in the use of fire extinguishers?”. This will depend on the level of risk in the workplace. Workplaces such as care homes have frequent fires and the live risk is high. Therefore persons staff in care homes will have regular and frequent fire training which should include fire extinguishers. There is no requirement to have live fire extinguisher training. However, there are benefits of opting for a course with live fire extinguisher training. As most persons have not used a fire extinguisher before or have done it very infrequently. Using a fire extinguisher, knowing how to hold it, how to direct the fire media onto the fire, how close to stand and when it is and is not safe to tackle a fire will be very useful when tackling a real fire. How long does my fire training certificate last? The frequency of fire training is usually detailed in a workplaces fire emergency plan. It will also be determined by the level of risk in the building. A high risk building or a building with a high life risk, staff should have more frequent fire extinguisher training. Those with less risk will need less frequent training. Our team can provide guidance for managers on the frequency of training. We can also support your fire extinguisher training with access to our online fire training course. Buy a place on our open fire extinguisher course and you can upgrade and include three years additional access to our website. Either call us or email us for more details. What do I need to bring on my fire training course? We recommend that you wear comfortable clothes and flat shoes. You must wear flat shoes if you want to take part in the practical fire extinguisher session. Attendees can also bring writing materials. You can take photos of our slides so that you do not spend too long taking notes! Booking a course with us is so easy! Either email or phone us with your preferred date. Once a date has been agreed, we will send our booking email and also ask you to agree our terms, once we heard frrom you, the course is confirmed. For more details about fire extinguisher training either call or email us now. Do you provide online fire extinguisher training? Yes. We do provide online fire extinguisher training in all of our online fire training courses. If you book an online fire training course you can also have a discount on any practical fire training that you carry out. Our online fire extinguisher courses look at the different types of fire. They also look at water, foam, dry powder, CO2 and wet chemical extinguishers. Our online course does not include the use of extinguishers on metal fires. We recommend that persons with this risk receive specialist training. Our general online fire extinguisher or “staff training course” takes about half an hour to do. If your company opts for a tailored online fire training session, we also add fire emergency plans and evacuation plans. If you and your staff do not need extra theory sessions after carrying out online fire training, you can attend the practical session part only of the course. You and your staff will receive a generous discount for this part of the session. Remember, we will give you an exact start time and location. Your staff must attend this slot, as we will not start the session late because we have other persons on the course. Either call or email us for more details. Can you give us advice on how many fire extinguishers we need and where to put them? Yes. We do discuss these issues if you take part in our fire marshal training course. Our trainers will provide you with a guide to how many fire extinguishers you need. Booking a fire extinguisher training London session with us is so easy. For open courses, send us an email. We will send a booking email and also ask for you to agree our terms. For in house of off site training for your staff, you should call us. Once we have agreed a date, we will send a booking email asking for info and also for you to agree our terms. When I book a fire extinguisher training London session – What happens next? Once you have booked your open fire extinguisher training London session, we will send an invoice. We also send joining instruction 7-14 days before the course date. Sometimes we send the joining instructions a little earlier. If you have booked an in house fire extinguisher training course, we will send an invoice to you a few days after you have booked. Our trainer will also call you 2 or 3 days before the course date to make arrival arrangements. We ask if you can prepare a list of attendees for our trainer, so he can take a register before the course starts. After the course has taken place you will receive your certificates by first class post. What is included in a live fire extinguisher training London session? Our live fire extinguisher sessions are very popular with staff. Many staff have never used a fire extinguisher before, so this course is ideal for staff to practice their firefighting skills. We use a fire training rig and different types of extinguisher. These include, water, foam, CO2 and wet chemical fire extinguishers. We let up to 10 persons tackle some small fires on an in house course. A further 10 persons can observe the live fire training session. Our team do need a suitable outside space. Our article above details what we need for a live fire training session. Still not sure? Why not contact us for more details. Either call or email us for a chat. You can also send a photo of the site you want to use. We can also view the area using Google Earth to see whether your area is safe. Don’t forget, we also carry out a risk assessment of the area before any exercise to reduce any hazards or risk. The best fire extinguisher training with a live fire training session. Book your in house fire extinguisher courses London now! How many persons can attend a fire extinguisher training London session at our site? If you opt for fire extinguisher training at your site, any number of persons can come on the session. However, outside we limit the number of staff on a practical session to twenty persons. 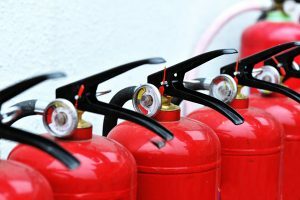 Many workplaces ask us to carry out multiple fire extinguisher sessions. We can provide up to four outside sessions a day, so can train up to eighty persons in the use of fire extinguishers. We do limit the number actually putting out fires to ten persons. Your staff can use water, foam, CO2 and wet chemical fire extinguishers on our live fire training rig. We can manage the size of the fire so your staff can tackle a fire safely with our trainer. Can we use our own fire extinguishers on our training session? Yes. We can use your fire extinguishers on your in house fire training session. However, we are unable to service the extinguishers and replace them. You will need to talk to your fire extinguisher engineer. If you do not have one, we can recommend really good companies that will help service and supply fire extinguishers. Do fire service training departments use fire fighters to carry out fire training? We understand the appeal of having fire fighters to carry out staff fire training! We were also serving fire fighters and had many requests for in house fire training. Local fire brigades including London and Essex use external fire trainers and non uniformed fire service personnel. Our company is able to provide officers who serve as fire fighters for your training. We have recently held fire extinguisher training London courses for schools, offices, nightclubs, restaurants, care homes, construction sites, factories and distribution companies. This month we working with nightclubs, shops, private hospitals, bars and hostels. If your staff need hands on fire extinguisher training, we can provide courses as open programmes, off site and also in house fire extinguisher courses London. We can carry out training in two of your sites in one day! If you need fire extinguisher training in more than one site, why not book us for the whole day? We can provide training at one site in the morning and also another session at a nearby venue in the afternoon. Our trainer will need a break between the two sessions, time to set and also time to travel between venues. Therefore we recommend a start no later 0900 a.m. and a second session at about 13.30 or 14.oo p.m. Although we do offer practical fire extinguisher training in London, we may need extra time for two practical sessions. This may add a small additional fee for our trainer. Do persons on the fire extinguisher course have to take part in the practical exercise? No. If your staff are on our open courses, they will be asked if they want to take part in the practical exercise. If they do not want to fight a small fire that is fine! Do you ever cancel practical sessions on an open course? This happens very rarely in extreme weather conditions. Sometimes we may have to only use certain extinguishers on the course due to wind conditions etc. If there is very heavy rain, we may postpone the practical session until later in the day. We have seen the online fire extinguisher session on your online training course. Can you produce and film a session for us at our building? Yes we can do that. We will film parts of your building to demonstrate the different classes of fire and risks in it. Finally we can film your staff tackling small fires in an outside space at your premises. The cost of this service will vary depending on location, types of extinguishers you have, the number of risks you want us to film. Normally, a bespoke training video will cost less than £1000 to produce. So why not add this online training session for your staff. We will need to shoot the video inside and outside of your building. Therefore we do need a day with good weather and lots of good light! Once we have filmed the video, it will take one week to edit and produce the video. In addition, we need to create a new online fire training course for your staff. Most bespoke online fire training courses / websites take two weeks to produce from filming day. Do you supply fire extinguishers and maintenance for workplaces? No we do not provide or sell fire extinguishers. We also do not provide annual maintenance or services. However, we can recommend some organisations if you are unsatisfied with your current provider. We do not receive any remuneration for any provider. How many fire extinguishers do we need in our workplace? Your fire risk assessor should tell you whether you have enough fire extinguishers. As a rough guide, you will require one general purpose fire extinguisher for each 200 sq metres of floor space on each floor. You will need a minimum of two general purpose extinguisher unless you have less than 100 sq metres of floor space. In addition to general purpose fire extinguishers, you will also need extinguishers to cover other risks in your premises. For example, you will need CO2 fire extinguishers for any electrical risk. You could place one CO2 extinguisher next to each general presuppose extinguisher. Always be sure that you do over provide fire extinguishers as this can be expensive. It may be cheaper to appoint an independent external fire risk assessor. He/She may be able to save you money over a few years by giving you a minimum number required. For more details about the number of fire extinguishers required why not book on our fire extinguisher courses London programme. Do you carry out off site fire extinguisher training? Yes. We do offer off site fire extinguisher training if you do not have room at your site or workplace. Our team can hire venues in East London or on the South Bank where you can have training with practical sessions. We usually take up to twenty persons per session on a practical course. Therefore you could have two back to back sessions and train up to forty persons in a morning or afternoon session. Our prices are the same as on site fire extinguisher training courses London. There will be a small charge payable to the venue. We can arrange this for you if required. Can you explain your fire extinguisher training open course and online refresher offer? If you book a place on our open course or your organisation buys an in house course, you can also have an online refresher course. You or your staff will have access to our online training course for three years. This is available for a small extra fee. This means that you do not need to come back onto our open courses or have an additional in house training session for three years. Remember our online courses are also accredited fire training programmes. How often are fire extinguisher courses London held? We usually hold open fire extinguishers courses London once per month. However we occasionally add additional fire extinguisher courses London when we experience higher demand. The best way to secure your place on our fire extinguisher courses London programme is by booking 6-8 weeks in advance. Do all fire extinguisher courses London sessions have practical exercises? Yes all of our fire extinguisher courses London sessions have a live fire fighting lesson. However, we may have to curtail some exercises due to extreme weather conditions. Do you provide fire extinguisher courses London programmes for specific type of workplace? We work in a care home and want the course to match our needs. We believe that our fire extinguisher courses London programme is suitable for all types of workplace. Therefore we do not run open fire extinguisher courses London sessions for specific types of workplace. However, we do run care home fire training courses in house and these can be tailored to your workplace. For more details about fire extinguisher training London or workplace fire courses either call or email us now. Is your fire extinguisher courses London programme accredited? Yes. As an approved training fire centre, our fire extinguisher courses London programme are accredited by the IFSM. Do you talk about water mist fire extinguishers on your fire extinguisher courses London programmes? Water mist fire extinguishers are discussed on our fire extinguisher training London sessions. In addition, a stock of water mist fire extinguishers is carried so your staff can tackle real fires with them. These exercises are limited to companies that have water mist extinguishers on their site. You can access a number of articles about P50 fire extinguishers. Simply put, these extinguishers have a 10 year warranty and do not require servicing annually. Some fire services sell P50 fire extinguishers, so there cannot be a better endorsement than this. Such fire services must then pass”maintaining fire fighting equipment” criteria in their audit of workplaces. Do you dispose of old fire extinguishers? Fire extinguishers should be disposed of carefully. They can be sent back to the original suppliers. They can also be sent to scrap dealers. Most fire extinguisher training providers do not take old extinguishers and this also includes City Fire Training. Is online fire extinguisher training suitable for our staff? Staff fire training should be based on the fire emergency plan for the building. This will include the types of fire extinguishers in the building and also classes and types of fire. Therefore if online fire extinguisher training is used in conjunction with training about the fire emergency plan, it will be suitable. There is no requirement for hands on fire extinguisher training for staff. Online fire marshal training and also online general staff fire training details are available on this website. These courses both include fire extinguisher modules. Does everybody in a workplace need fire extinguisher training? Fire safety law requires all persons to know the content of their fire plan. The plan includes information about fire fighting equipment. Therefore all persons in a workplace must have fire extinguisher training. The training does not have to include a live fire session. 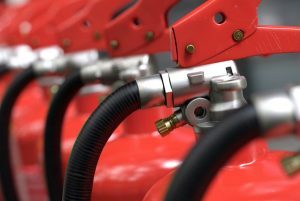 Fire extinguisher training can be provided in a number of ways bu our team: Open fire extinguisher training London programmes held every month. In house fire extinguisher training with or also without live fire training can be provided. In addition, organisations can hire our venue for off site fire extinguisher training. Alternatively, staff can do our online fire extinguisher training course. Can our fire marshals and fire wardens provide fire training to our other staff? Fire marshals and fire wardens should have more detailed training than other staff. This may make them suitable to provide fire training for other staff. A trainer should have sufficient experience, knowledge and understanding of their subject. An experienced fire marshal or warden who is able to to teach and talk to groups could provide fire training. The content of staff fire training should be based on the fire emergency plan. This includes fire extinguishers and other fire fighting equipment in the building. Our fire marshal courses details the type of content that a fire emergency plan should include and also includes fire extinguisher training. Book on one of our fire extinguisher training London courses now! What happens if we have bad weather during our in house course? We do carry some umbrellas so staff can shelter from the rain. We can also try to take some cover for attendees if there is any available. Don’t worry about our trainers – they will be wearing fire tunics! Lastly, we can always wait until there is a lull in the weather and then carry out the practical when the weather is better. Why do your fire extinguisher training London courses fill up so quickly? So why do our fire extinguisher training London courses fill up very quickly. There are several reasons for this! We have a number of regular clients who block book a number of places on each course. They often ask for extra spaces above their normal quota, so this can account for more than half of the places on each programme. Secondly, we have other clients who carry out annual or bi annual training. This also takes up a number of places on the courses. Thirdly, we rank highly in search engines, so often get “passing customers” who want single course places. In addition, this course includes live fire extinguisher training, so attendees can tackle small fires. Lastly, we are very good and always get great feedback for this IFSM approved course. If you need spaces on a fire extinguisher course, we recommend that you book as soon as you our course advertised.